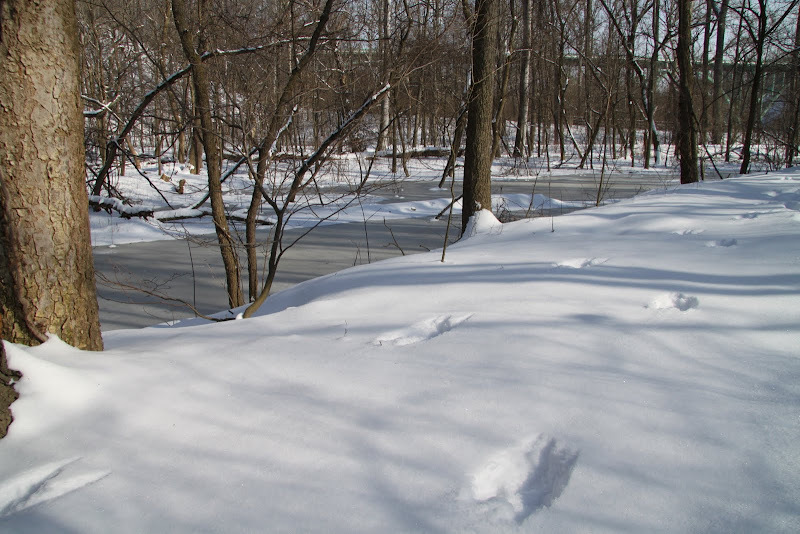 i thought i'd share a few images from a winter walk in a park near casa mouse. 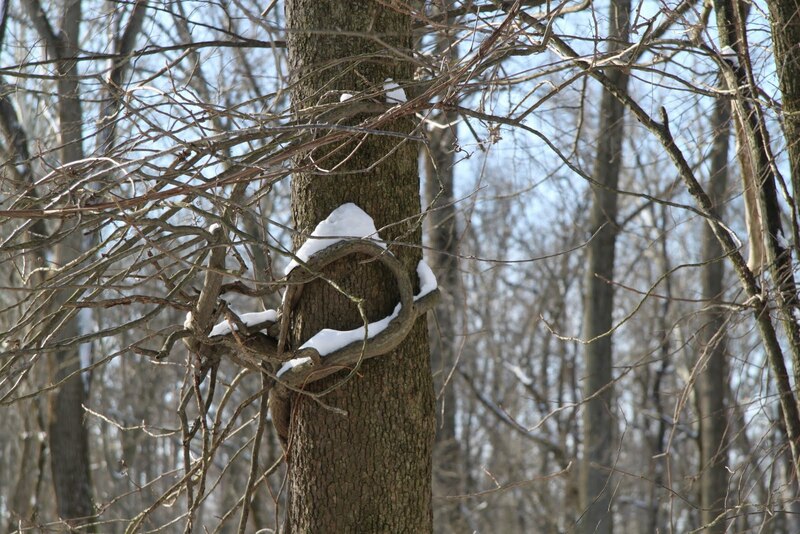 i love hiking in the winter - i find there are many things made visible that go unnoticed other times of year. perhaps if more people got out and walked in the woods during winter, more people would appreciate winter. 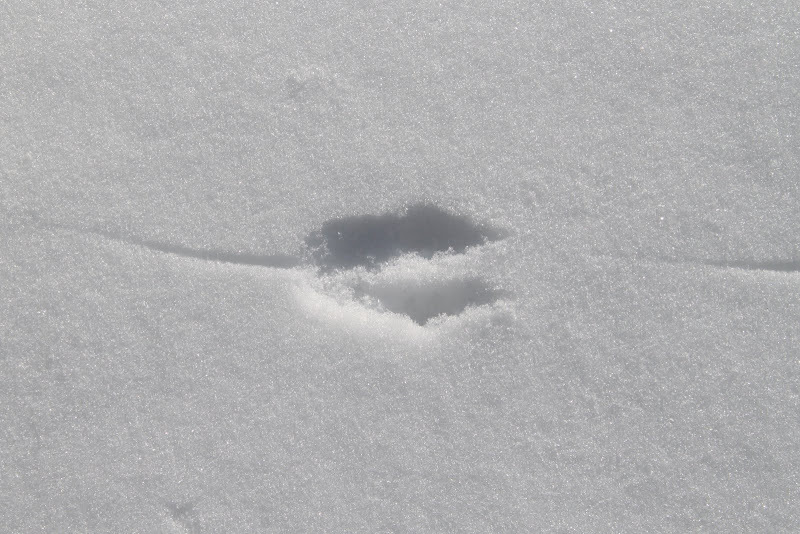 the track of a mouse is so cute - it even looks like a mouse! hmmmm, makes me wonder, onomatopoeia is a kind of word from a sound associated with what is named - i wonder if there is a name for a track that looks like the animal which leaves it? 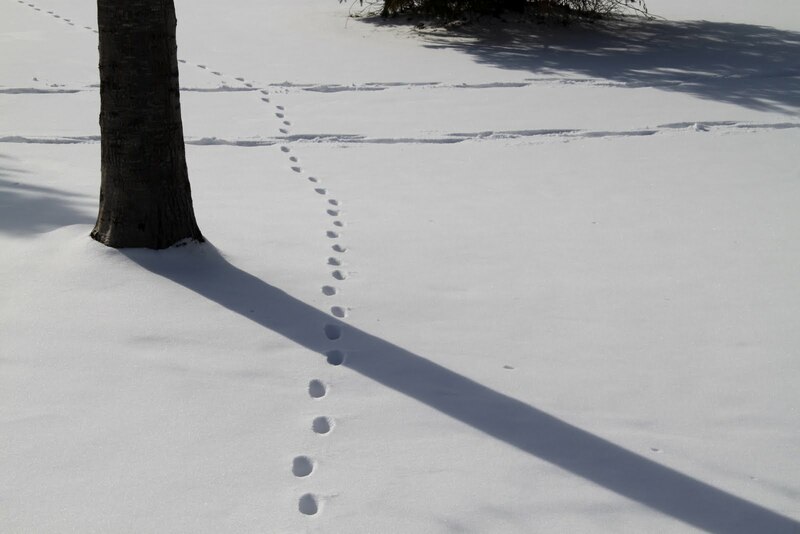 squirrel tracks - can't say they look like a squirrel! i expect these are the tracks of an off lease dog - or maybe it is something more exciting like a coyote! alas no snaps of the rabbit or deer tracks i crossed, but here's are a couple more pics i particularly like. 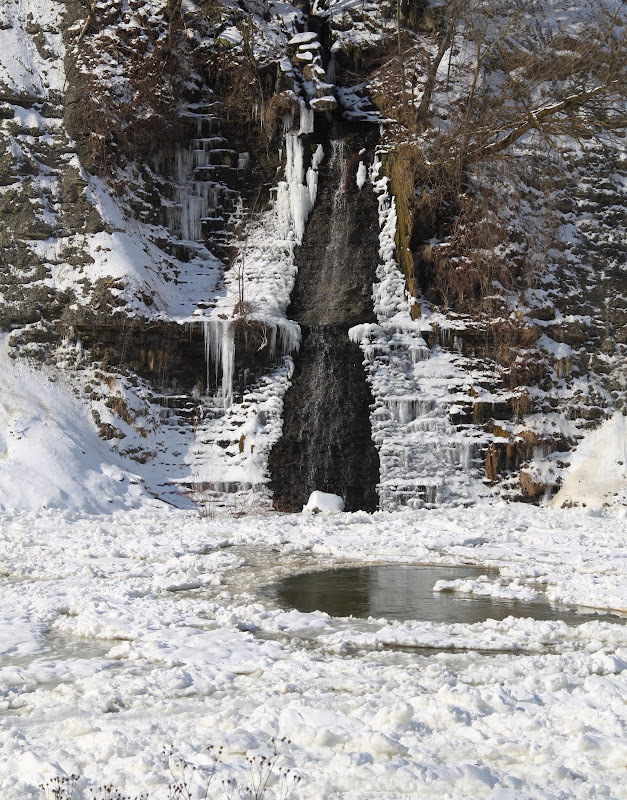 an icy waterfall runs down shale cliffs into an iced up river. when the water runs more openly one generally see lots of different types of water fowl in this part of the river- geese, grebes, mergansers, and ducks. this past weekend i saw none - i did see tracks of aforementioned birds - but alas didn't capture any snaps of the tracks - my mind and eye was elsewhere i suppose. i miss the birds. our weather roller coaster continues - today started out nice and snowy, but the day progressed so did the temperatures - by noon we were above freezing. everything now is wet and drippy; the forecast calls for more of the same. 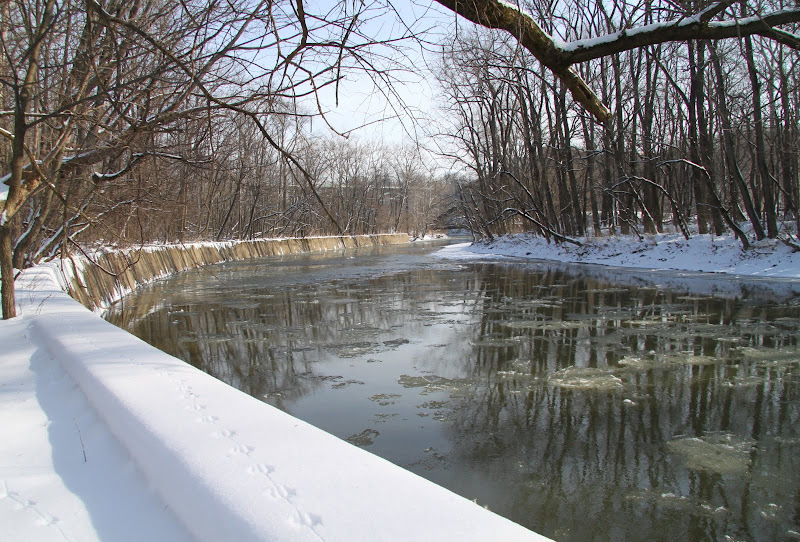 the january thaw has been coming and going all month long. it will be interesting to see what february brings. i'll probably skip the nature hike this weekend and try and catch up on movies. there are only a few weeks left before the academy awards. a few years ago i started a tradition of visiting my (fellow movie loving) mom for oscar weekend so can watch the academy award show together. the program a great deal more fun if i've seen the movies that are nominated - and i try and get in as many films nominated as possible, at least in the big categories like best picture, best actor, and best actress. my mom is doing really well this year, there are only two of the nine films nominated for best picture that she hasn't seen. i on the other hand, have only seen three of the nine - my goal this weekend is to try and get in two films. in case you are curious, the three i've seen are: the artist (which i loved, loved, loved - too bad there's not a category for best animal in a leadinhttp://www.blogger.com/img/blank.gifg role - uggie (who plays jack the dog) would have that award paws down! midnight in paris (again two enthusiastic thumbs up!) and moneyball (which i enjoyed). i love the Apache blessing and your photography ! I gave you one of my weekly Goddess Awards too! i couldn't reply to your email, so i wanted to pop back in and say i'm happy you're happy with my feature! not sure where that snow sculpture was made, but i sure wish i had a part in making it, so "divine"! That frozen waterfall shot is amazing! I'm just visiting from Posts of the Week. Beautiful photos--the one of the river & the one of the waterfall are really so wonderful! You are such a good photographer kimy! Makes me want to go walking in the snow ... if we get any! Meanwhile, I enjoy looking at yours. Great shots! We've avoided the 'white stuff' so far, but we're bound to get a dusting sooner or later. Excellent photos, as always. Which model of camera do you have, Kim? I learned a lot more about cameras and their quality in my photo class -- I think I need a better camera with a larger sensor. Are you happy with yours? I've seen some of the oscar movies, but several of them haven't even opened in the UK yet. We get everything late! elise - thank your for the shout out! the everyday goddess blog rocks! eva & kipp thanks for dropping in and leaving a lovely crumb! john - thanks - there's some mighty nice rivers & waterfalls out in your neck of the woods! hope it won't be too terribly long before i can do a wander in the pnw - aiming for 2013 - here it is only january and my wander card for 2012 seems already booked! martin -ah for me snow is something i welcome rather than avoid! glad you enjoyed ths pics! steve - your photos are amazing!!! i might be old school, but i think it is the photographer's eye more than the type of camera that makes a photo - and you have a terrific eye! that said, i am happy with my camera - my current model is the canon t1i - i hope i don't wear it out as quickly as the last one (but i can't complain, i'm sure i got more than my share of shuttering out of it)....conventional wisdom has it that dslr's last btw 150,000 - 300,000 clicks! we're seeing the descendents today and tomorrow i'm going to extremely loud - which will leave 4 more to see on the b.p. list! Kim, you are absolutely right that the photographer's eye creates the picture -- far be it from me to suggest otherwise! (I love it when I show someone a picture and their first response is, "Wow, you have a great camera!" LOL!) Your pictures are always terrific. During my class, though, I was really impressed with the crispness and clarity of the photos from cameras with larger sensors. I got a better appreciation for the differences between certain models. Mine is fine for now, but I'm upgrading next time!